Like our SS1 kit our 3lber bar spinner PDB2 is available only as a basic chassis kit. It is an improved version on my Sons robot "Pure Dead Brilliant". It has competed at Carolina Combat and at Robogames 2007 (where it took 4th place), Motorama 2008, Carolina Combat, a second and a first place at Franklin 2007 and 2008. A completed kit "Maniac Kathy" took second place at both Motorama and Franklin in 2009. The kit consists of a fully welded tube chassis that has mountings for a weapon axle , a motor bracket mounting (not the bracket itself as that depends on the weapon motor used), and a flange to mount the rear roll over bar/drive motor mounts. The UHMW rollover bar is included along with the necessary hardware to mount the two main parts together. 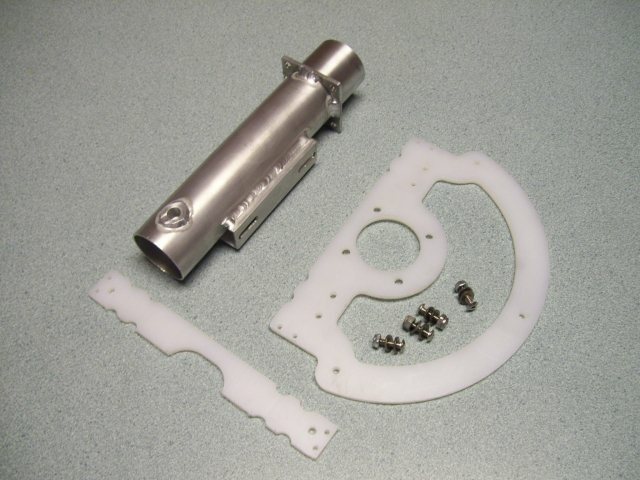 The prototype used two larger Banebots gearnmotors but production kits are designed to use much lighter 24mm Banebots gearmotors, a list of other required parts is provided below. The prototype uses a 35-30 Brushless motor, ESC and 1000mAH LiPo battery from Hobby King to provide a lethal hits with its 9.5" Titanium and Steel blade. the production kit can take a 10.5" Blade and mount the ESC inside the top tube. This list is not exhaustive. Other parts may be required and some modification of parts and use of a Drill press and hand tools will be required, This chassis is designed as an aid to building a competitive robot. It is not a "turn key" solution. Here are a couple of videos of the prototype and kits in action. "Pure Dead Brilliant" v "Mission Mayhem"
"Pure Dead Brilliant v "Wedge"
"Maniac Kathy" v "Cloud of Suspicion"
"Pure Dead Brilliant" v "Yeti"
This Bot will be offered as a basic chassis only and is intended for more experienced builders. Spinners are dangerous and the prototype is quite capable of causing severe injuries to the builder, operator or spectators. It should only be operated or tested within an suitable arena and with strict adult supervision..